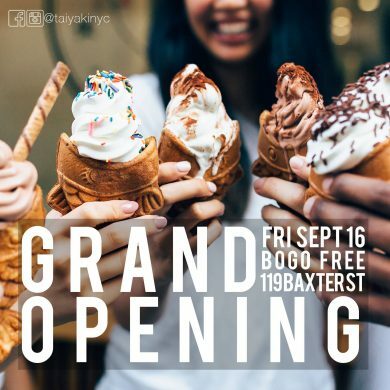 Kazusa Jibiki, the owner of the popular Nolita Thai eatery Lovely Day, will be expanding to the Lower East Side next week. Jibiki’s new venture, entitled Gohan, will be a return to her Japanese heritage. Unlike Lovely Day’s Southeast Asian diner fare, Gohan, which means “a meal” in Japanese, will be all about wholesome, comforting Japanese home cooking, Jibiki explained. The restaurant, which is located at 14a Orchard Street at Canal Street, will open its doors next Monday, on August 1. Although the menu is still going through its final stages, Jibiki has given Bedford + Bowery a hint of what her version of Japanese home cooking will entail. You’ve seen the stickers plastered all over town — Okiway finally opens tonight in Bushwick, complete with wasabi flavored beer. Oodles of noodles! While East Williamsburg has a new ramen refuge, the East Village just scored a new soba spot. Chef David Bouhadana just opened his second restaurant in the neighborhood — not bad for a 28-year-old who grew up in Florida. Sushi Lounge isn’t the only Japanese spot in the East Village that just moved to new digs on the same street. Over on East 9th, Otafuku has, as expected, moved over to a larger new space that — just like Egg’s upgrade — will hopefully put the kibosh on having to wait outside.